This is the fifth of the Bee Libraries, and the first in a National Park. 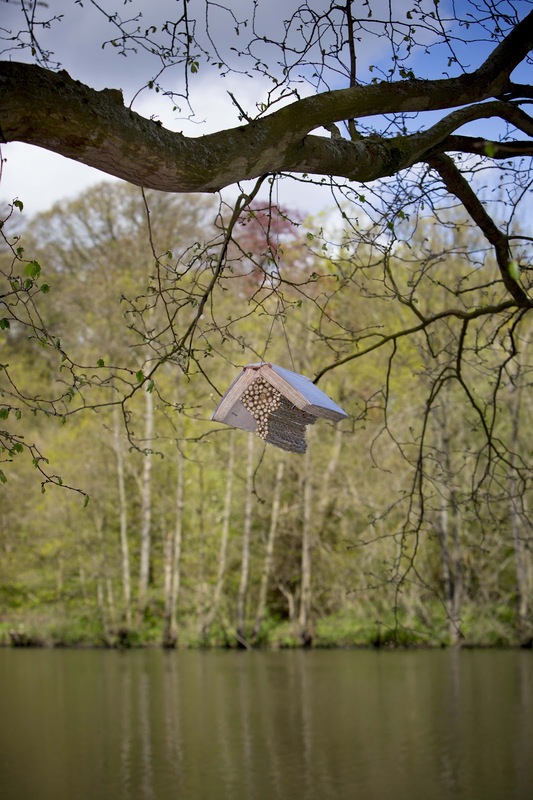 The book-nests, which are designed as dwellings for solitary bees, were installed in ash trees near Janet's Foss, Malham, in the Yorkshire Dales National Park. The choice to only secure them in ash was a recognition of Ash Die-Back disease. 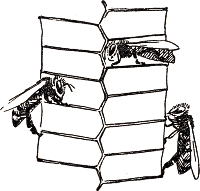 The books which I read and extracted poems from include Fabre's Bramble-Bees and Others, Frank Cheshire's 19th century English classic Bees & Bee Keeping, and a memoir by local beekeeper, Ken Pickles, Beekeeping in Wharfdale. The photographs of the installation, by Hannah Devereux, were taken in July 2014, as part of her survey of all my bee-related projects across the British Isles. The poem-labels were photographed by Luke Allan on a research field-trip in 2012.
to his own heather honey following the Chernobyl disaster. Walk Guide: To get to Janet’s Foss, walk North East out of Malham village along Gordale Lane. It’s a 15 minute walk. Follow the public footpath down into the woods. The first bee-nest is on your left as you enter. The last nest is on your left at the end of the wood, above the stream. All of the nests are on the path-side of the stream; most are on the stream-side of the path. Some of the poems which were produced from the books are published on The Bee Bole. You can read about Ash Dieback on the Tiger Sheds website.